The following is a list of the tallest male tennis players that I am aware of and know about. If anybody knows of a taller professional tennis player please leave a comment. The average height of a man in the United States today is 5' 9 1/2". As you can see below all the pro tennis players on this list are much taller than that. Is it an advantage in tennis to be tall? The answer is yes absolutely. It is far easier for a tall player to hit the ball over the net with great force while serving than it is for a shorter player. Serving is a huge part of tennis. T-1. Ivo Karlovic - 6' 11"
At a height of 6' 11", Ivo Karlovic from Croatia is the tallest professional tennis player of all-time. Ivo is still an active player at the age of 38. He has won 8 ATP singles titles in his career and earned just about $9 million. To show how height helps a player. Ivo Karlovic's serve has been recorded at 156 mph, second fastest on record, and Ivo holds the record for most career aces with 12,302. T-1. Reilly Opelka - 6' 11"
American Reilly Opelka is tied with Ivo Karlovich as the tallest tennis player of all-time at 6' 11" in height. Reilly is just 20 years old. He has yet to win a tournament and his career earnings are approaching $500,000. 3. 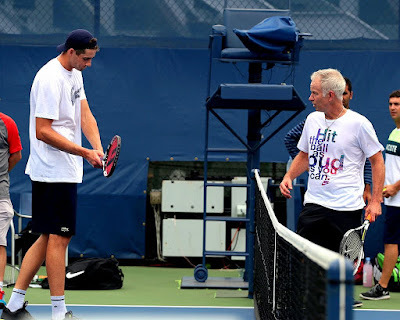 John Isner - 6' 10"
American John Isner is probably the best known tallest tennis player. Standing 6' 10" tall, Isner has won 12 ATP singles titles and his career earnings are approaching $13 million. In 2010 in the first round at Wimbledon, John Isner defeated Nicholas Mahut in the longest tennis match in history. Isner won the match by a score of 6-3, 3-6, 6-7, 7-6, 70-68. The 5th set tally is not a typo. The match lasted a record 8 hours and 11 minutes. 4. Andreas Siljestrom - 6' 9"
Andreas Siljestrom is a 6' 9" tall mainly doubles tennis player from Sweden. He is 36 years old and has never won a tournament and his career earnings are $350,000. Active Tennis Players Who are 6' 7"
Active Tennis Players Who are 6' 6"
Well Known Tennis Players Who are 6' 5"
For those who are curious here are the heights of the best tennis players in the world. Andy Murray is 6' 3", Novak Djokovic is 6' 2", Roger Federer and Rafael Nadal are both 6' 1".